Manufacturer of positive displacement pumps, Mouvex, part of PSG, recently announced that its Abaque series peristaltic pumps are now available with FDA and EC 1935/2004 certified hoses. 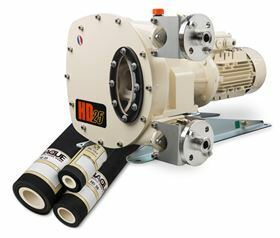 The Abaque series pumps have a seal-free design that eliminates leaks and by incorporating the new hygienic hoses into the design, they meet the strict hygiene requirements for the production of food and beverage products. The design also eliminates product contamination as the pumped product is contained within the hose and not exposed to the moving parts of the pump. Additionally, their smooth operation allows them to handle the shear-sensitive products with delicate particles, often found in food and beverage operations, with ease. These self-priming pumps can run forward or in reverse and offer suction-lift capabilities up to 9 metres, as well as the ability to run dry without affecting performance, pressure and accuracy.